Benzac AC Wash (Benzoyl Peroxide) is a facial cleanser which can also treat acne. It works by unblocking the pores, getting rid of any excess oils and destroying bacteria. Benzac AC Wash (Benzoyl Peroxide) is a facial cleanser which can also treat acne. It works by unblocking the pores, getting rid of any excess oils and destroying bacteria. As well as this, it can lessen skin irritation by triggering the release of glycerine, a compound which is known to have moisturizing and emollient properties. The main ingredient in this face wash is categorized as an organic compound, and it can function as a peeling agent. This means that by increasing the turnover (the shedding of old skin cells and their subsequent replacement with newly grown cells), it can help rid the face of spots. In addition to this, it can unclog the sebaceous glands, thereby reducing oiliness (which is known to contribute to acne spot formation). Lastly, its antibacterial action allows it to eliminate the bacteria which are known to trigger inflammation of the skin and spots. This helps to manage and treat acne, leading to an improvement in the appearance of the face and a decrease in discomfort. 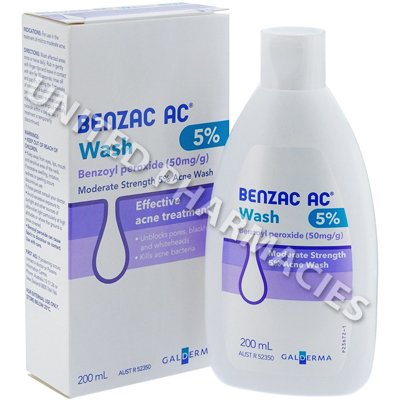 Benzac AC Wash (Benzoyl Peroxide) is provided in a bottle which contains 200mg of the water based solution. The strength is 5 per cent. Your doctor or dermatologist will be able to answer all questions you have with regard to proper application and the required frequency of administration. Patients are normally told to apply water to the face first, and then to apply the solution. It should be gently rubbed until a lather is formed. Leave it on the skin for roughly 30 seconds and then rinse it all away. Gently dry the skin. Keep your doctor aware of your condition and report all side effects. If you suffer from severe irritation or any other serious side effects, see your doctor immediately. Do not let the face wash come into direct contact with the eyes or any other part of the body that is sensitive. Always use Benzac AC Wash (Benzoyl Peroxide) as you have been prescribed by your doctor. Never self-medicate or change your dosage without first consulting your doctor. The correct dosage can vary depending on your health, medical history, and the severity of the condition being treated.